I just got a few lovely old Ladies Home Journal magazines. 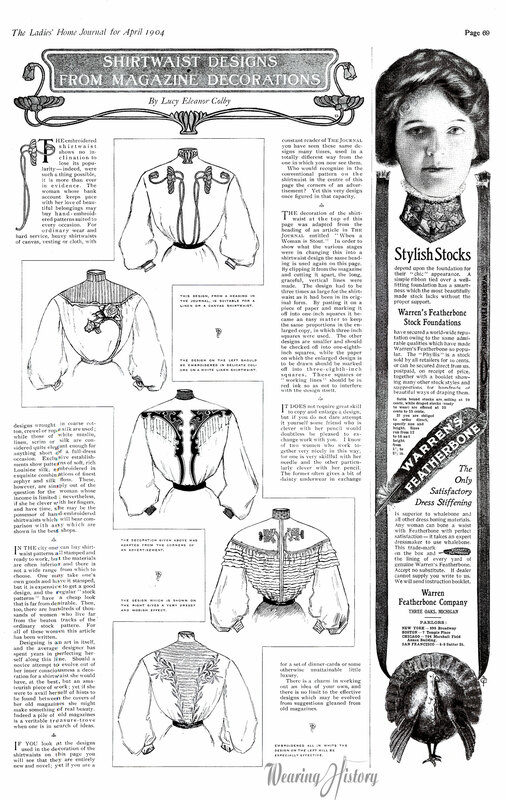 This one, from April, 1904, shows us the fashion in shirtwaist decorations from 109 years ago. Maybe you could take these designs and incorporate them into my Edwardian Blouse Pattern. What is novel about the designs below is that they are adapted from e pretty flourishes and borders that are often seen in magazines of this period. These, of course, come from the Ladies Home Journal. In fact, the blouse just below the title has the same motif as the title decoration. Novel, isn’t it? If you enlarge the article you can read their suggestion for enlarging the designs for use in garments. Click on the image for a larger version you can read.